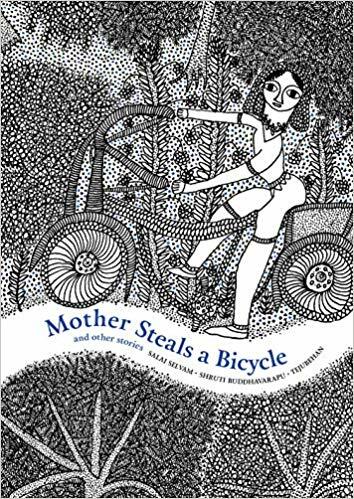 Mother Steals a Bicycle and Other Stories is a children’s book by Salai Selvam and Shruti Buddhavarapu. The illustrations are by Tejubehan. Mother – daughter stories are like a game of dots and boxes. You take turns to draw lines on the dots and only one of you wins. But the boxes, like stories – are complete because the two of you sit together and draw them. When ‘Mother steals a bicycle and other stories’ begins, the 11-year-old daughter already knows what stories to ask from her mother and the mother is just as eager to tell them. “Amma’s best stories are ones where trouble actually comes looking for her” says the daughter suggesting that in the other stories, it’s usually her mother who goes looking for trouble. Even so, the girl has decided that the bicycle story is the best. And so the mother tells us about the time she stole an uncle’s bicycle and took off with it. Of course she didn’t know how to ride it – she just learnt it on the way — as she rode it screaming through the village. My favourite part of this story is when she realises that she may have learnt how to ride it but she has no idea how to stop it. So on and on she goes into two, three villages. When the girl asks, “But why didn’t you stop amma?” – I believe nobody is prepared for the answer. She only gave me dots and I drew the lines– Maybe the cloth was beige in color with faded orangish spots. Maybe she hid her new frock under a cot one day – hoping her sisters wouldn’t find it. Maybe she never learnt to ride the bicycle, maybe she climbed big trees when she wanted to hide from her mother. In the fifth story she tries to catch a peacock because she wanted to sit on it. In the seventh she volunteers to act in village plays where she says she loved wearing turbans and fake mustaches to play men. Whether it is befriending her own shadow and playing with it or going in search of cicadas to put them in a matchbox and listen to their humming sounds – the worry that someone could be waiting at home never overpowers her fascination with the outside world – and that is a delight to listen to – especially when women tell us these stories. When my grandmother told me stories from her childhood, she began every story by telling me she woke earlier than anyone else in the house to go collect firewood. After this point, she’d usually lose interest in telling me the rest of the story. And the other parts of her day and her childhood were left to my imagination. One day she told me she loved eating jack fruit seeds so she’d put them out to dry in the backyard where the sun fell. She’d sit by the door and watch them. Today when I think about her, I see a young girl sitting by the door, hands knotted together, legs spread far, her eyes soft, now closing now waking, but always – watching the jack fruit seeds. I am curious about what our mothers’ and our grandmothers’ bodies must have been like when they were young. How they looked when they bent and walked. How they lifted firewood and pots and hoisted them up. How they jumped and how they sat. And that’s why the illustrations of the young girls and the women in the book are special. Much like the stories, the bodies of the women in these illustrations are agile and full of life. It is oddly liberating that neither the older girls nor the women carry the weight of breasts. It’s almost as if their bodies are shadows. The words are agile too. Like the illustrations, they too seem unburdened and shadow-like. Some words in the book are chosen to act out their sounds and meanings. So the word ‘bolt’ really ____bolts___ and the word ‘float’ floats. In the sixth story we see that the mother’s favourite thing to do as a kid was to play with her own shadow. Somewhere in the business of living in a city with tall buildings and never having to walk anywhere, I think we have forgotten our shadows. Are they still alive? Do they still follow us? Do they not like cities? In the games that our shadows play with us and the stories that our mothers show and hide from us – this book weaves a finished game of dots and boxes. Even so, unlike boxes – stories have a way of belonging to no one – not to the one who tells it, not even to the one who listens to it. Then whom do stories belong to? ← What happened when Bengaluru’s working class women had a #MeToo meeting?